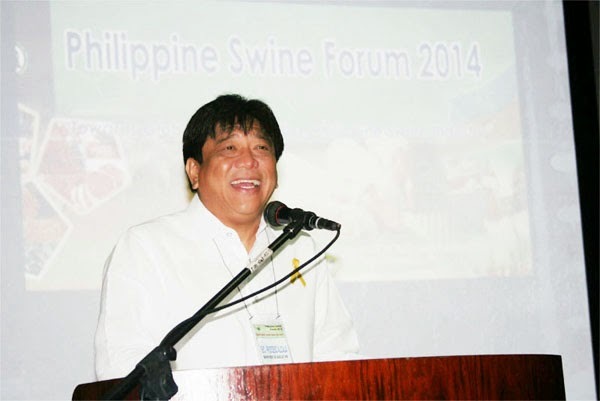 Department of Agriculture (DA) Secretary Proceso Alcala graced the 2014 Philippine Swine Forum last July 24 and spoke of how significant the support of the private sector is in the success of the government’s initiatives for the livestock industry. “The government and the private sector should work hand in hand (in boosting the livestock sector),” he said. 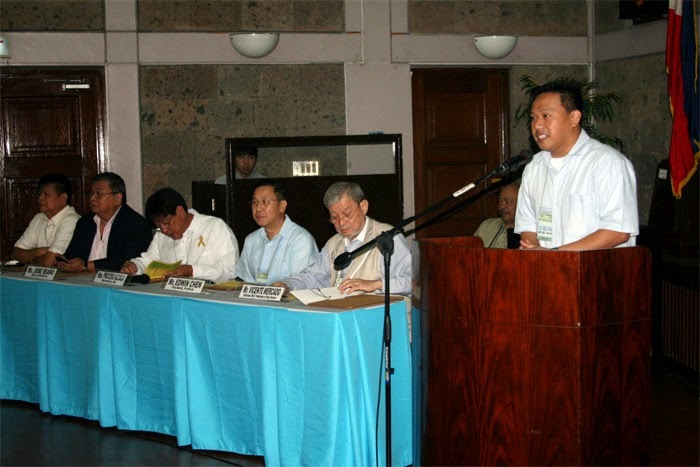 Addressing around 170 hog industry players, including producers, exporters, dealers, processors, smallhold farmers and members of the Agricultural and Fishery Councils (AFCs), and officials from concerned government agencies and the academe who were present at the forum held at the Bureau of Soils and Water Management Convention Hall, Sec. Alcala stressed that the government continues to undertake efforts for the benefit of livestock stakeholders. “Magkakaroon na po tayo ng triple A cutting floor sa Tanuan, Batangas at triple A dressing plant for poultry sa Tarlac.Nakikita ninyo po na hindi po kami nagtutulug-tulugan but, we also need your support para tuluy- tuloy nating maisaayos ito. At hindi po tayo titigil rito. We want to improve everything,” Sec. Alcala said. Agriculture Secretary Proceso Alcala speaks to hog industry players at the 2014 Philippine Swine Forum, underscoring the importance of private sector engagement in the implementation of various programs and projects for the industry. Citing export opportunities in countries such as South Korea, Japan and the United Arab Emirates, Sec. Alcala also emphasized that the livestock industry should maximize the fact that the country is free from the foot and mouth disease as the ASEAN Economic Community integration takes place. “We are also pushing for the exportation of our local produce; we should strive to produce high quality meat and meat products. Nevertheless, I congratulate our country’s livestock growers (for their achievements) especially those from the chicken industry which is currently thriving,” the agri chief said. He also revealed upcoming credit initiatives for livestock raisers, especially from the poultry industry, who have been affected by typhoon Glenda (Rammasun). Sec. 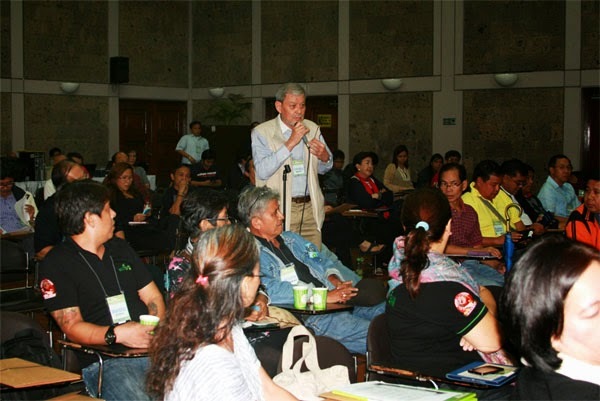 Alcala also expressed gladness on the conduct of the Philippine Swine Forum, spearheaded by the Philippine Council for Agriculture and Fisheries (PCAF) through its Committee on Livestock, Poultry and Feed Crops (CPLFC), and looked forward to the recommendations of the participants. “Kayo po ang nakakaalam ng industriya, kayo po ang dapat na pinakikinggan ng pamahalaan. [As the champions of the industry, the government should truly listen to you.] I will study all the recommendations drawn from this forum and I will try my best to encourage our economic managers to support your proposals,” he said. The forum featured a host of relevant topics such as the Philippine Swine Situation and Outlook, High Prices of Pork, Swine Performance for 2013, Past, Present & Future of the Swine Industry in the Eyes of the National Federation of Hog Farmers, DA’s Support Program for the Swine Industry, Forecast on Soybean/Soybean Milk Usage, Export Potential of Swine & Market Situation of the Swine Industry, Credit Program for Livestock, Native Pigs Raising in the Philippines, Corn Feed Ingredients Outlook, Food Safety Act of 2013, Eradication and Biosecurity of Classical Swine Fever or Hog Cholera, Challenge in the Prevention and Control of Porcine Epidemic Diarrhea, and Application of Molecular Methods in Swine Breeding & Selection. Data from the Livestock Development Council, now consolidated with the National Agricultural and Fishery Council as the PCAF, show that the hog industry continues to be a major contributor in the country’s agriculture, next to palay, with 13.48 percent in 2013 based on percentage distribution of value of production at constant price. In the same year, 2.01 million tons (liveweight) of hog valued at P191.92 million was produced. Of the more than 11 million heads recorded in a recent hog inventory, backyard farms account for 65 percent while the commercial ones account for the remaining 35 percent. However, comparative data show that the share of backyard farms is declining while that of commercial farms is increasing, as 2000 figures reveal that backyard farms account for 77 percent of the total inventory and 23 percent for commercial farms. Meanwhile, according to the Philippine Statistics Authority (PSA), Regions 3 and 4A account for most of the country’s total hog production from 2011 to 2013, with a combined share of around 30-34 percent. In her presentation, PSA Livestock & Poultry Statistics Division Chief Nenita Yanson revealed that the country’s total swine inventory as of April 1, 2014 was 11.99 million heads, which is 11.45 percent lower than last year’s inventory. In 2013, bulk of the local pork production was consumed by households accounting for 63 percent of total pork supply, while the remaining 37 percent went to processing and institutions. Given the total local pork production, per capita consumption of pork is estimated at 12.34 kilogram per year. On the other hand, Pork Producers Association of the Philippines President Edwin Chen offered some solutions to address the continuing price increase of pork which is attributed to the continuing food inflation, hog diseases and increase in the prices of raw materials. “There is a need to draft a roadmap for pork and for the government to increase its support for the industry particularly by increasing access and information on biosecurity and swine health especially for backyard farmers and support these backyard farmers to modernize their production facilities to increase efficiencies. Commercial farms can also provide data to and work with the government to find other coordinating measures to make pork affordable to consumers,” he said. Livestock stakeholders propose measures to address challenges faced by the industry and ultimately be able to accelerate its improvement.. Discussions during the forum resulted in some resolutions which include recommendations to hold the swine forum annually, create a national genetic program to ensure the quality of breeds, formulate a policy that will limit the use of mechanically deboned meat, and establish a concrete scheme to encourage swine producers to report actual statistics on swine population and diseases. Industry stakeholders also sought for stricter implementation of all border safeguards to ensure quality of imported meat, implementation of national biosecurity measures for swine, creation of a task force to study and analyze the backyard hog-raising in the Philippines, prioritization of local producers when there is demand for pork in the country, efforts to immediately address swine diseases, and for the Philippine Crop Insurance Corporation to develop a more responsive insurance scheme for the swine industry. PCAF Exec. Dir. Ariel Cayanan thanks private sector representatives present at the forum for their participation and looks forward to stronger collaborations for the improvement of the hog industry. Other DA officials, namely, Undersecretary for Livestock Jose Reaño and Assistant Secretary for Livestock Davinio Catbagan also graced the forum organized in light of the theme “Towards Globally Competitive Philippine Swine Industry,” together with PCAF Exec. Dir. Ariel Cayanan, Deputy Exec. Dir. Florabelle Uy-Yap and PCAF-CPLFC Chairperson Rufina Salas. In his message, Dir. Cayanan stressed that the PCAF will ensure that the recommendations from the forum “will be appropriately endorsed, so that it will bear positive results and redound to great benefits” for the hog farmers and other stakeholders in the country.